A lthough the wife of one of our richest peers, the Duchess of Portland, who will act as one of Queen Mary's canopy bearers at the Coronation, cares little for town life or the whirl of society. She loves the country, and is especially happy at Langwell Lodge, Caithness. Flyfishing is one of her favourite pastimes, and she is also extremely fond of swimming. She has a deep sympathy for the poor and aged, and it was through her influence that the Duke devoted his Turf winnings to the building and endowment of almshouses at Welbeck, his chief seat, and one of the most wonderful mansions in the world. 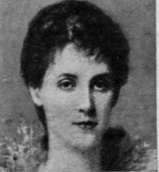 The Duchess, who, before her marriage, in 1889, was Miss Winifred Dallas-yorke, has three children. She is especially interested in animals, and is an active worker on behalf of Our Dumb Friends' League, as well as a supporter of that excellent institution, the Home of Rest for Horses.